Adherence to Long-Term Therapies: Evidence to Action. Geneva, Switzerland: World Health Organization;2003.
van den Bemt BJ, Zwikker HE, van den Ende CH. Medication adherence in patients with rheumatoid arthritis: a critical appraisal of the existing literature. Expert Rev Clin Immunol. 2012;8(4):337-351. Raebel MA, Schmittdiel J, Karter AJ, Konieczny JL, Steiner JF. Standardizing terminology and definitions of medication adherence and persistence in research employing electronic databases. Med Care. 2013;51(8 Suppl 3):S11-21. Zullig LL, Blalock DV, Dougherty S, et al. The new landscape of medication adherence improvement: where population health science meets precision medicine. Patient Prefer Adherence. 2018;12:1225-1230. Bosworth HB, Granger BB, Mendys P, et al. Medication adherence: a call for action. Am Heart J. 2011;162(3):412-424. Singh JA, Saag KG, Bridges SL, Jr., et al. 2015 American College of Rheumatology Guideline for the Treatment of Rheumatoid Arthritis. Arthritis Care Res (Hoboken). 2016;68(1):1-25. Smolen JS, Landewe R, Bijlsma J, et al. EULAR recommendations for the management of rheumatoid arthritis with synthetic and biological disease-modifying antirheumatic drugs: 2016 update. Ann Rheum Dis. 2017;76(6):960-977.
van den Bemt BJ, van den Hoogen FH, Benraad B, Hekster YA, van Riel PL, van Lankveld W. Adherence rates and associations with nonadherence in patients with rheumatoid arthritis using disease modifying antirheumatic drugs. J Rheumatol. 2009;36(10):2164-2170. Anghel LA, Farcas AM, Oprean RN. Medication adherence and persistence in patients with autoimmune rheumatic diseases: a narrative review. Patient Prefer Adherence. 2018;12:1151-1166. Scheiman-Elazary A, Duan L, Shourt C, et al. The Rate of Adherence to Antiarthritis Medications and Associated Factors among Patients with Rheumatoid Arthritis: A Systematic Literature Review and Metaanalysis. J Rheumatol. 2016;43(3):512-523. Curtis JR, Bykerk VP, Aassi M, Schiff M. Adherence and Persistence with Methotrexate in Rheumatoid Arthritis: A Systematic Review. J Rheumatol. 2016;43(11):1997-2009.
de Achaval S, Suarez-Almazor M. Improving treatment adherence in patients with rheumatologic disease. J Musculoskelet Med. 2010;27:1-11. Harley C, Frytak J, Tandon N. Treatment Compliance and Dosage Administration Among Rheumatoid Arthritis Patients Receiving Infliximab, Etanercept, or Methotrexate. Am J Manag Care. 2003;9:S136-S144. Grijalva C, Chung CH, Arbogast P, Stein C, Mitchel E, et al. Assessment of Adherence to and Persistence on Disease-Modifying Antirheumatic Drugs (DMARDs) in Patients With Rheumatoid Arthritis. Medical Care. 2007;45(10):S66-S76. Oladapo A, Barner J, Lawson K, Novak S, Rascati K, et al. Medication Effectiveness with the Use of Tumor Necrosis Factor Inhibitors Among Texas Medicaid Patients Diagnosed with Rheumatoid Arthritis. J Manag Care Pharm. 2014;20(7):657-667. Tkacz J, Ellis L, Bolge SC, Meyer R, Brady BL, Ruetsch C. Utilization and adherence patterns of subcutaneously administered anti-tumor necrosis factor treatment among rheumatoid arthritis patients. Clin Ther. 2014;36(5):737-747. Harnett J, Gerber R, Gruben D, Koenig AS, Chen C. Evaluation of real-world experience with tofacitinib compared with adalimumab, etanercept, and abatacept in RA Patients with 1 previous biologic DMARD: Data from a U.S. administrative claims database. J Manag Care Spec Pharm. 2016;22(12):1457-1471. Machado MAA, Moura CS, Guerra SF, Curtis JR, Abrahamowicz M, Bernatsky S. Effectiveness and safety of tofacitinib in rheumatoid arthritis: a cohort study. Arthritis Res Ther. 2018;20(1):60. Kim G, Barner JC, Rascati K, Richards K. Examining time to initiation of biologic disease-modifying antirheumatic drugs and medication adherence and persistence among Texas medicaid recipients with rheumatoid arthritis. Clin Ther. 2016;38(3):646-654. Bonafede M, McMorrow D, Proudfoot C, Shinde S, Kuznik A, Chen C. Treatment persistence and healthcare costs among patients with rheumatoid arthritis after a change in targeted therapy. Am Health Drug Benefits. 2018;11(4):192-202. Staff Writer. 8 reasons patients don’t take their medications. Practice Management. 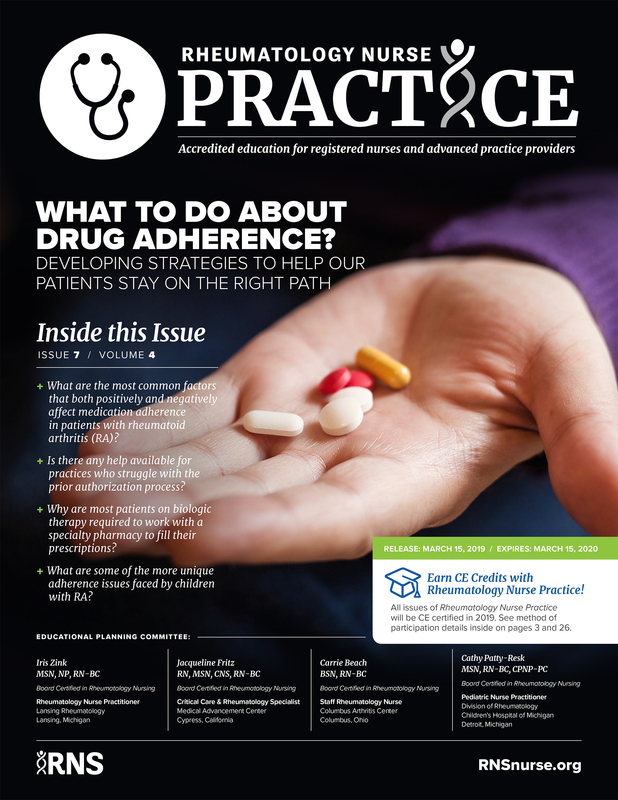 Available at wire.ama-assn.org/practice-management/8-reasons-patients-dont-take-their-medications. Accessed September 14, 2018. Salt E, Frazier SK. Adherence to disease-modifying antirheumatic drugs in patients with rheumatoid arthritis: a narrative review of the literature. Orthop Nurs. 2010;29(4):260-275. Horne R, Albert A, Boone C. Relationship between beliefs about medicines, adherence to treatment, and disease activity in patients with rheumatoid arthritis under subcutaneous anti-TNFalpha therapy. Patient Prefer Adherence. 2018;12:1099-1111. Horne R, Chapman SC, Parham R, Freemantle N, Forbes A, Cooper V. Understanding patients’ adherence-related beliefs about medicines prescribed for long-term conditions: a meta-analytic review of the Necessity-Concerns Framework. PLoS One. 2013;8(12):e80633. Gagnon MD, Waltermaurer E, Martin A, Friedenson C, Gayle E, Hauser DL. Patient beliefs have a greater impact than barriers on medication adherence in a community health center. J Am Board Fam Med. 2017;30(3):331-336. Bristo-Myers Squibb. Prescribing Information. ORENCIA (abatacept) for injection and subcutaneous use. Revised 06/2017. Abdelnabi M, Patel A, Rengifo-Pardo M, Ehrlich A. Insurance coverage of biologics for moderate-to-severe psoriasis: a retrospective, observational 5-year chart review. Am J Clin Dermatol. 2016;17(4):421-424. Chambers JB, Wilkinson C, Anderson J, Chenoweth M. Variation in private payer coverage of rheumatoid arthritis drugs. JMCP. 2016;22(10):1176-1181. UnitedHealthCare. Clinical Program Drug Step Therapy – Commercial. 2018. Available at www.uhcprovider.com/en/resource-library/drug-lists-pharmacy/clinical-drug-step-therapy.html. Accessed September 14, 2018. Blue Cross Blue Shield of Michigan Prior Authorization and Step Therapy Coverage Criteria. Sept 2018. Available at www.bcbsm.com/content/dam/public/Consumer/Documents/help/documents-forms/pharmacy/prior-authorization-and-step-therapy-guidelines.pdf. Accessed September 14, 2018. American Medical Assocation. Prior authorization: The current landscape. Available at ww.ama-assn.org/sites/default/files/media-browser/premium/psa/prior-authorization-toolkit_0.pdf. Accessed September 24, 2018. Bagwell A, Kelley T, Carver A, Lee J, Newman B. Advancing patient care through specialty pharmacy services in an academic health system. J Manag Care Spec Pharm. 2017;23(8):815-820. Cutler T, She Y, Barca J, Lester S, Xing G, et al. Impact of pharmacy intervention on prior authorization success and efficiency at a university medical center. JMCP. 2016;22(10):1167-1171. Cantini F, Nannini C, Niccoli L, Petrone L, Ippolito G, Goletti D. Risk of tuberculosis reactivation in patients with rheumatoid arthritis, ankylosing spondylitis, and psoriatic arthritis receiving non-anti-TNF-targeted biologics. Mediators Inflamm. 2017;2017:8909834. Cantini F, Niccoli L, Goletti D. Tuberculosis risk in patients treated with non-anti-tumor necrosis factor-alpha (TNF-alpha) targeted biologics and recently licensed TNF-alpha inhibitors: data from clinical trials and national registries. J Rheumatol Suppl. 2014;91:56-64. Cantini F, Niccoli L, Goletti D. Adalimumab, etanercept, infliximab, and the risk of tuberculosis: data from clinical trials, national registries, and postmarketing surveillance. J Rheumatol Suppl. 2014;91:47-55. Lim CH, Chen HH, Chen YH, et al. The risk of tuberculosis disease in rheumatoid arthritis patients on biologics and targeted therapy: A 15-year real world experience in Taiwan. PLoS One. 2017;12(6):e0178035. Sanofi USA. Kevzara Sample Letter: Appeals. Available at www.kevzarahcp.com/kevzara-resources. Accessed Sept 9, 2018. Seven Steps to Appeal a Denied Medical Claim. Available at www.arthritis.org/living-with-arthritis/health-care/insurance-and-pharmacy/insurance-appeal.php. Accessed September 14, 2018. Fein A. Exclusive update: the state of specialty pharmacy accreditation in 2017. Available at www.drugchannels.net/2017/04/exclusive-update-state-of-specialty.html. Accessed September 14, 2018. Hagerman J. Specialty pharmacy: A unique and growing industry. PharmacyToday. Available at www.pharmacist.com/specialty-pharmacy-unique-and-growing-industry. Accessed September 14, 2018. Barlow J, Faris R, Wang W, Vergbrugge R, Garavaglia S, Aubert R. Impact of specialty pharmacy on treatment costs for rheumatoid arthritis. Am J Pharm Benefits. 2012;4:SP49-SP56. Stockl K, Shin J, Lew H, Zakharyan A, Harada A, Et al. Outcomes of a rheumatoid arthritis disease therapy management program focusing on medication adherence. J Manag Care Pharm. 2010;16(8):593-604. Chisholm-Burns MA, Kim Lee J, Spivey CA, et al. US pharmacists’ effect as team members on patient care: systematic review and meta-analyses. Med Care. 2010;48(10):923-933. Etanercept (Enbrel) Prices and Coupons. Available at www.goodrx.com/etanercept?drug-name=etanercept. Accessed September 14, 2018. Dopsi J, Li P, Ladage V, Pettit A, Taylor AJ. Impact of cost sharing on specialty drug utilization and outcomes – a review of the evidence and future directions. Am J Manag Care. 2016;22(3):188-197. Yazdany J, Dudley RA, Chen R, Lin GA, Tseng CW. Coverage for high-cost specialty drugs for rheumatoid arthritis in Medicare Part D. Arthritis Rheumatol. 2015;67(6):1474-1480. Ganguli A, Clewell J, Shillington AC. The impact of patient support programs on adherence, clinical, humanistic, and economic patient outcomes: a targeted systematic review. Patient Prefer Adherence. 2016;10:711-725. Rubin D, Mittal M, Davis MM, Johnson S, Chao J, et al. Impact of a patient support program on patient adherence to adalimumab and direct medical costs in Crohn’s disease, ulcerative colitis, rheumatoid arthritis, psoriasis, psoriatic arthritis, and ankylosing spondylitis. J Manag Care Spec Pharm. 2017;23(8):859-867. 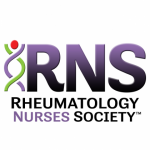 Harnett J, Wiederkehr D, Gerber R, Gruben D, Bourret J, Koenig W. Primary nonadherence, associated clinical outcomes, and health care resource use among patients with rheumatoid arthritis prescribed treatment with injectable biologic disease-modifying antirheumatic drugs. J Manag Care Spec Pharm. 2016;22(3):209-218. Wohlfahrt A, Campos A, Iversen MD, et al. Use of rheumatology-specific patient navigators to understand and reduce barriers to medication adherence: Analysis of qualitative findings. PLoS One. 2018;13(7):e0200886. Howland R. Medication adherance. Journal of Psychosocial Nursing. 2007;45(9):15-21. Marcum ZA, Sevick MA, Handler SM. Medication nonadherence: a diagnosable and treatable medical condition. JAMA. 2013;309(20):2105-2106. Marengo MF, Suarez-Almazor ME. Improving treatment adherence in patients with rheumatoid arthritis: what are the options? Int J Clin Rheumtol. 2015;10(5):345-356. Lavielle M, Puyraimond-Zemmour D, Romand X, et al. Methods to improve medication adherence in patients with chronic inflammatory rheumatic diseases: a systematic literature review. RMD Open. 2018;4(2):e000684. Zullig LL, Peterson ED, Bosworth HB. Ingredients of successful interventions to improve medication adherence. JAMA. 2013;310(24):2611-2612. Bruera S, Lopez-Olivo MA, Barbo A, Suarez-Almazor ME. PMS67. Use of medication reminders in patients with rheumatoid arthritis. Value in Health. 2014;17(7). Evers A, Kaaimaat F, van Riel P, de Jong A. Tailored cognitive-behavioral therapy in early rheumatoid arthritis for patients at risk: a randomized controlled trial. Pain. 2002;100(1-2):141-153. Arora S, Peters AL, Agy C, Menchine M. A mobile health intervention for inner city patients with poorly controlled diabetes: proof-of-concept of the TExT-MED program. Diabetes Technol Ther. 2012;14(6):492-496. Miller TA, Dimatteo MR. Importance of family/social support and impact on adherence to diabetic therapy. Diabetes Metab Syndr Obes. 2013;6:421-426. Morgan C, McBeth J, Cordingley L, et al. The influence of behavioural and psychological factors on medication adherence over time in rheumatoid arthritis patients: a study in the biologics era. Rheumatology (Oxford). 2015;54(10):1780-1791. Health Online 2013. Washington, DC: Pew Research Center;2013.
dotHealth Consumer Health Online – 2017 Research Report. Available at www.get.health/research. Accessed September 14, 2018. Benetoli A, Chen TF, Aslani P. Consumer health-related activities on social media: exploratory study. J Med Internet Res. 2017;19(10):e352. Hamm MP, Chisholm A, Shulhan J, et al. Social media use among patients and caregivers: a scoping review. BMJ Open. 2013;3(5). Patel BN, Audet PR. A review of approaches for the management of specialty pharmaceuticals in the United States. Pharmacoeconomics. 2014;32(11):1105-1114. Drug-Pricing Tiers. Available at www.arthritis.org/living-with-arthritis/health-care/insurance-and-pharmacy/pricing-tiers.php. Accessed September 14, 2018. Clinical Pharmacy and Specialty Drugs Prior Authorization Programs. UnitedHealthcare. Available at www.uhcprovider.com/en/prior-auth-advance-notification/prior-auth-specialty-drugs.html. Accessed September 14, 2018.